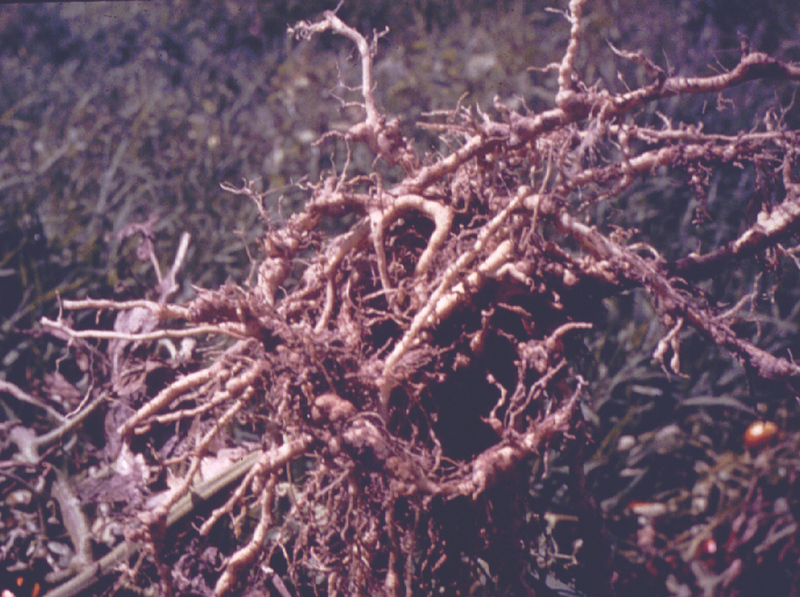 Root-knot nematodes are microscopic worms that can infect vegetable roots causing serious symptoms and producing galls or knots on the roots. 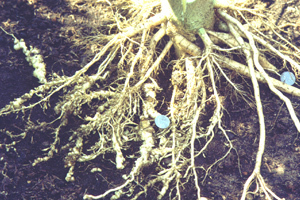 The nematodes impede the flow of water and nutrients to the plant. 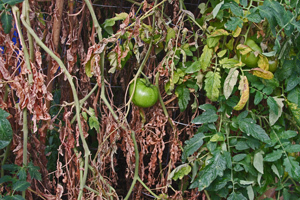 Plants can be less vigorous, stunted, chlorotic and can wilt easily in the heat of summer, grow more slowly and produce less and smaller fruits. 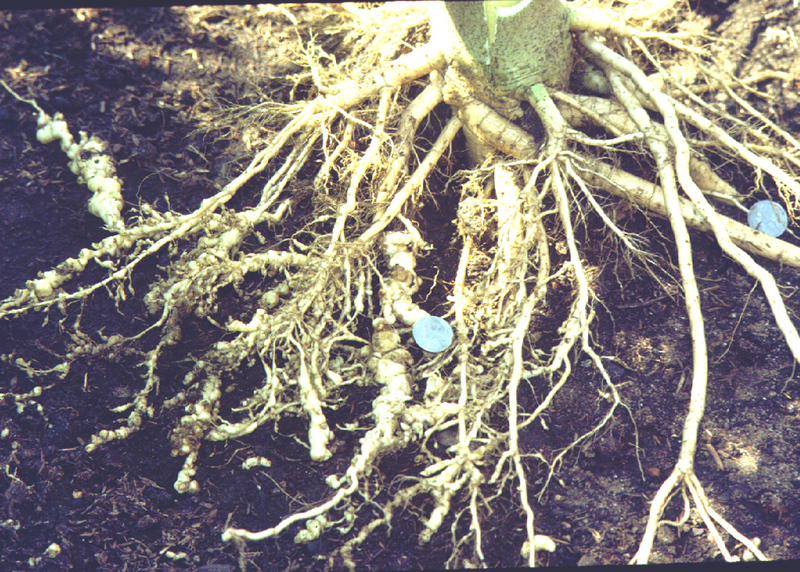 The root-knot nematode has a very wide host range (more than 2,000 hosts) and thus can reproduce on most plants. Broccoli and cauliflower are two nonhosts. Root-knot is usually not a problem in colder climates because the winter temperatures are too cold for them to survive. A week of subzero temperatures with no snow on the ground could freeze the soil down deep enough to eliminate this pest. Do I have this nematode in my garden? 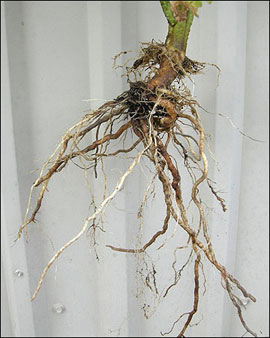 Root-knot is easily diagnosed by simply looking at the roots of plants. Gently pull or dig up roots and look for galls or knots on the roots. These galls vary in size from a few centimeters to up to an inch in diameter. If found, note which parts of the garden are infected. Care should be taken not to spread the nematode from infested areas to no infested areas. Root-knot nematodes predominately are introduced into gardens by infected soil or plant roots, infected vegetable transplants, dirty garden tools (including tillers or tractors) with infested soil, muddy boots, vehicle tires, or improperly or incompletely composted material. 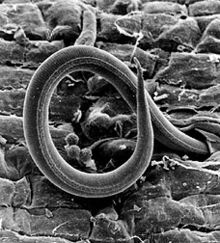 Thousands of root-knot nematode eggs or worms might be present in a tablespoon of soil. Can root-knot nematode infestation be controlled in a garden? Yes, but not easily. If no galls or knots are found on the roots of your garden plants in the fall, great care should be taken not to introduce it. 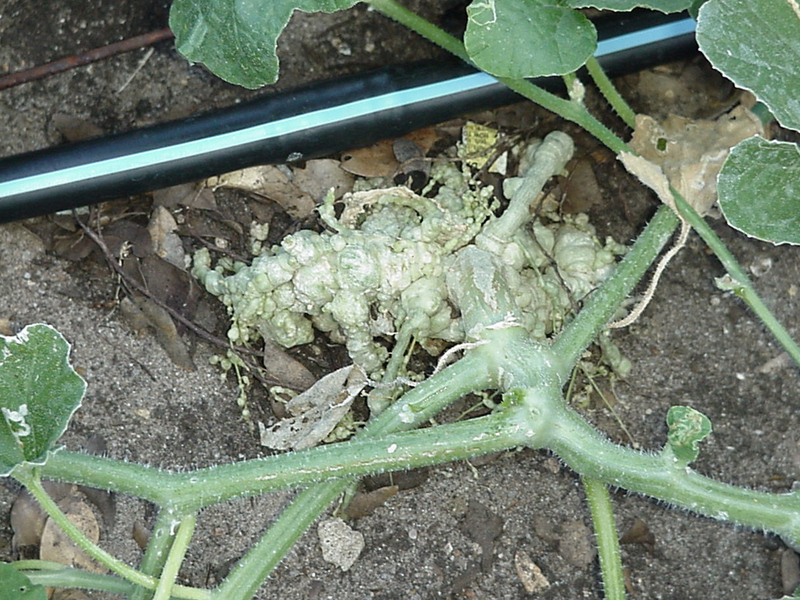 Good garden sanitation will keep the root-knot nematode out. Always clean garden equipment if it has been used in another garden. Buy garden transplants from a reputable dealer. Do not add compost or soil to your garden unless you are sure that it is not infested with root-knot nematodes. If galls or knots are found on your plant roots, remove as much of this root material as possible from the garden. These roots should not be composted. They can be dried and burned or bagged and properly disposed of. An infested garden should be kept clean of grass or garden debris to allow the cold winter temperatures to penetrate the soil. Winter tilling (if possible) could help facilitate the penetration of cold temperatures by turning over and loosening the soil. 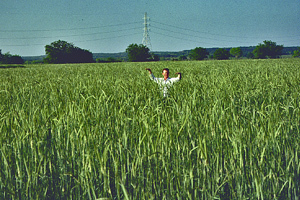 Winter cover crops of rye when plowed in March and allowed to decompose before planting have been known to produce a substance that is toxic to nematodes. 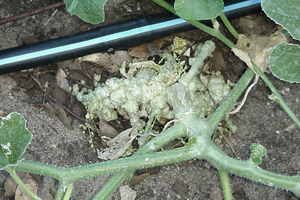 Since the root-knot nematode does not become active until the soil temperature reached 64 degrees F, early spring vegetables may avoid damage. Also, planting summer vegetables as early as possible will give them a good start to establish larger root systems before the root-knot nematode becomes active. Soil solarization is another way to reduce root-knot nematode populations. 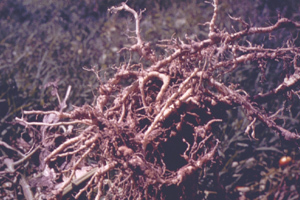 Soil temperatures that reach 125 degrees F for 30 minutes can kill root-knot nematodes. The garden section to be treated should first be tilled and moistened. Then it should be covered with clear plastic (2 to 4 millimeters) for the months of June to August. Resistant varieties offer the easiest, least expensive, and most effective method of controlling nematodes in the home garden. Nematodes are unable to feed on a resistant variety, resulting in a population decline over time due to starvation (as long as weed hosts of the nematodes are also eliminated). Planting nematode resistant plants (VFN) is a good way of controlling root-knot nematodes, especially if their numbers have not become excessive. 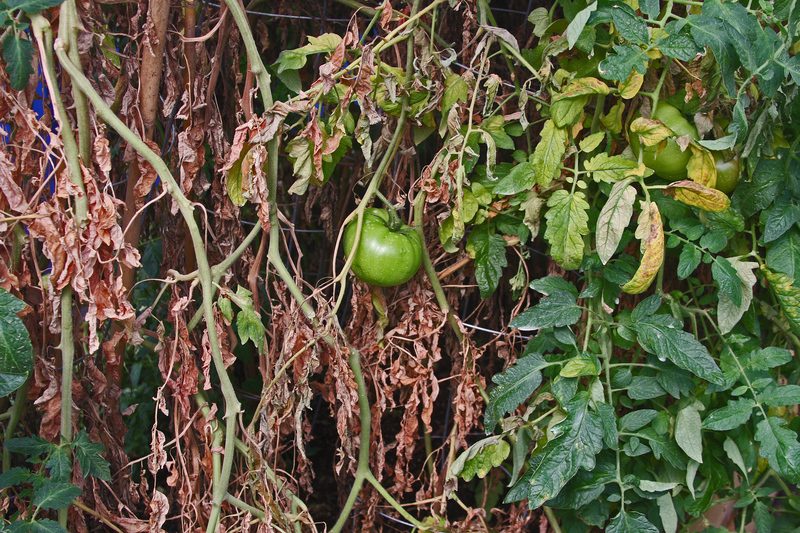 There are many varieties of resistant tomatoes, but not many choices with other vegetables. After two years of resistant plants, the number of root-knot nematodes should be low enough to plant a susceptible variety again. 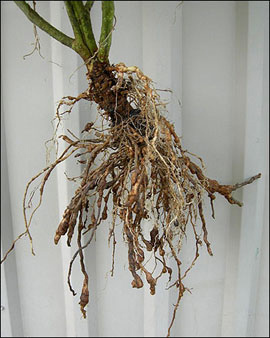 A season of susceptible plants, though, will allow the root-knot population to again become high. The best nematode resistant varieties for this area are ‘Valley Cat’, ‘Tycoon’ and ‘Celebrity’ for large fruit and ‘BHN 968’ (‘Dwarf Cherry Surprise’) for a cherry tomato. Not any Heirloom varieties are nematode and/or disease resistant. In the home landscape, some bedding plants are resistant to root-knot nematodes including zinnia, salvia and marigold. 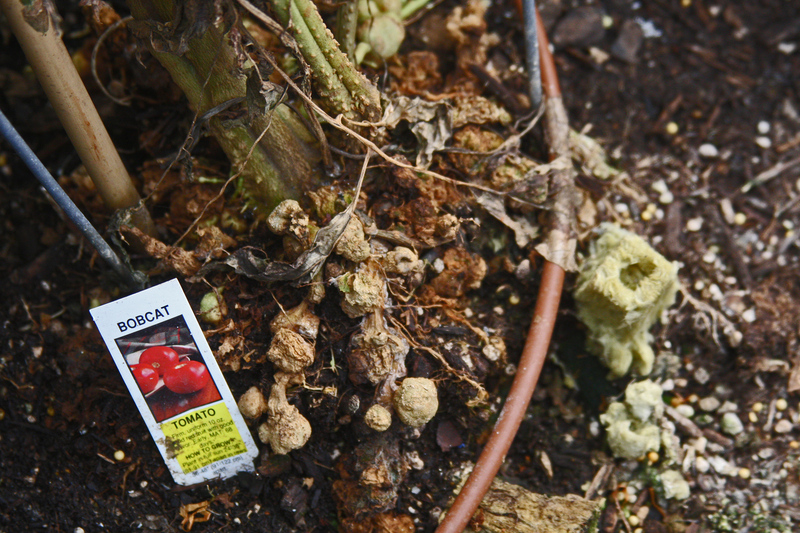 Some damage may occur to snapdragons and pansies, especially when plants are stressed. 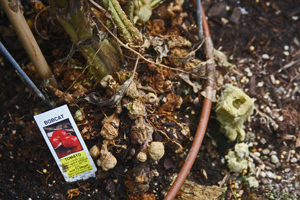 Begonias, coleus and impatiens are most likely to be damaged in areas where root-knot nematodes are a problem. Rotate the Garden to a New Location: This method will help to prevent nematodes and diseases from becoming established in one area. If new space is not available, rotate plants so that resistant plants are moved to an area where susceptible ones had grown previously. Usually three years of growing no susceptible plants (such as asparagus, corn, onions, garlic and strawberries) in a particular garden space is needed to reduce nematode populations. Fallow Period With Summer Tilling: The population of root-knot nematodes can be reduced significantly in one season by repeated tilling (every 10 days) of the garden soil during the hot, dry summer, to bring the nematodes to the surface to be killed by the drying of the sun. 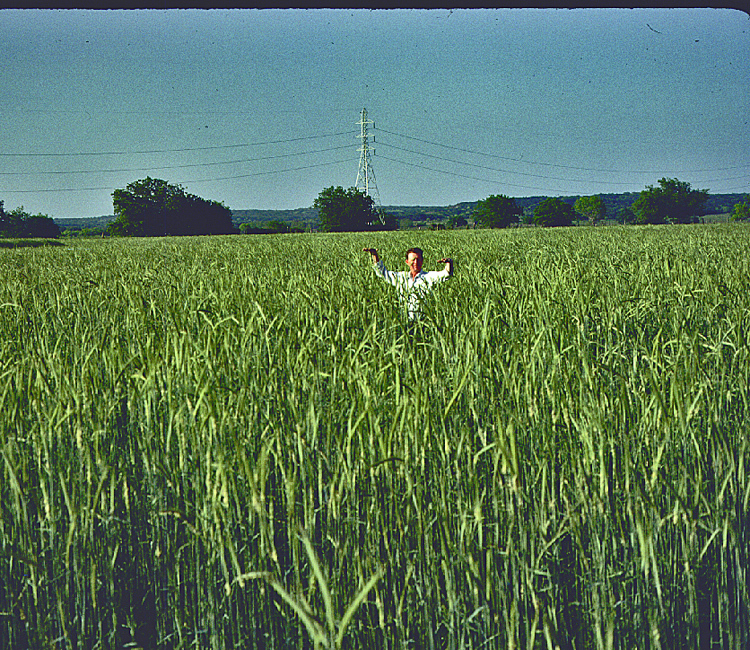 The fallow section must be kept free of weeds and old roots to be effective. Covering the fallow section between tilling with black plastic may help. Plant Certified Disease-Free Transplants & Seed Potatoes: All plants brought to the garden should be examined carefully for signs of very tiny knots on roots. Avoid planting any plants that look suspicious. On Irish potatoes, small bumps on the surface may indicate infection by nematodes. Remove All Plants Immediately After Harvest: Destroy plants and plant roots by pulling up immediately after harvest. Do not let stalks stand through the winter. Work the soil two to four times in winter, allowing the sun and weather to exert their killing effect. 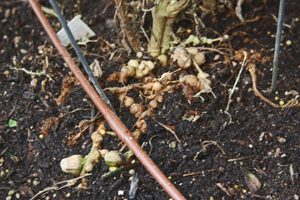 Establish a Rotation System: Research has shown that root-knot nematode populations can be reduced in soils that have been previously planted with French or French dwarf-type marigolds. There are some biofumigant plants, such as French marigolds and mustards, whose roots produce a biochemical substance that can be toxic to and kill root-knot nematodes. However, not all mustard and marigold varieties act as a biofumigant. Some varieties that do are: bonita mixed, gypsy sunshine, scarlet Sophia, single gold, petite harmony, petite gold, tangerine, crackerjack and flor de muerto marigolds. Use French dwarf-type marigolds, such as ‘Petite Gold’ or ‘Petite Harmony.’ ‘Tangerine’, ‘Single Gold’ (sold as ‘Nema-gone’), and ‘Lemon Drop’ are also good choices. 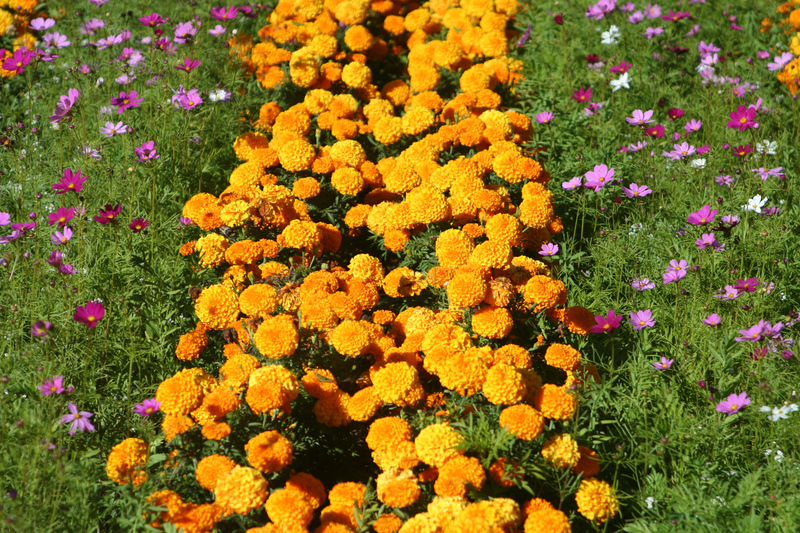 For the first year, plant marigolds in spots where the greatest amount of nematode damage has occurred, or plant marigolds in strips several feet wide across the garden to establish a rotation scheme. 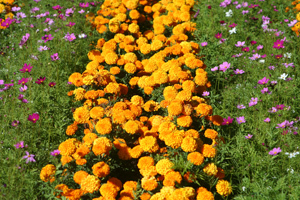 Marigolds must be planted as a solid planting, no more than 7-inches apart. They must be grown for at least two months, and then turned under. Keep marigolds free of grass and weeds to prevent nematodes from feeding on roots other than marigolds. Plant vegetables sensitive to root-knot nematodes — such as tomatoes, okra, lima beans, beans and others — in the marigold area the following spring. Rotate marigolds to the same area at least every other year, as long as nematode problems exist. Planting these marigolds mixed in with susceptible garden vegetables is not very effective. Soil Amendments: The addition of any organic matter to the garden will improve soil health, and will increase microbial activity in general, which will have the benefit of improving plant health.